Barangay Suba was founded by their indomitable teniente del barrio (popularly known now as Barangay Chairman) Ingko Oloy Eulogio Dagondon on 1888. The name was said to be derived from the flowing water coming from the swampy area to the open sea. Old folks called it in their native twang “suba” which brings a lot of fishes of different kinds from the sea. The people were pleased because it made them easier to catch fish and made it available to their daily consumption. Barangay Suba has been reputed as Anda’s Fish Country because majority of the residents are engaged in fishing and other related fishing activities. Today, that swampy area is now transformed into a huge fish pond that locals could enjoy luscious and fresh tilapia, bangus, among others. Barangay Treasurer Eliseo Caberio Sr.
PASIL – An epitome of the bounty of nature, Suba can be touted as Anda’s version for Bohol’s Loboc river. The site is an extraordinary surprise. 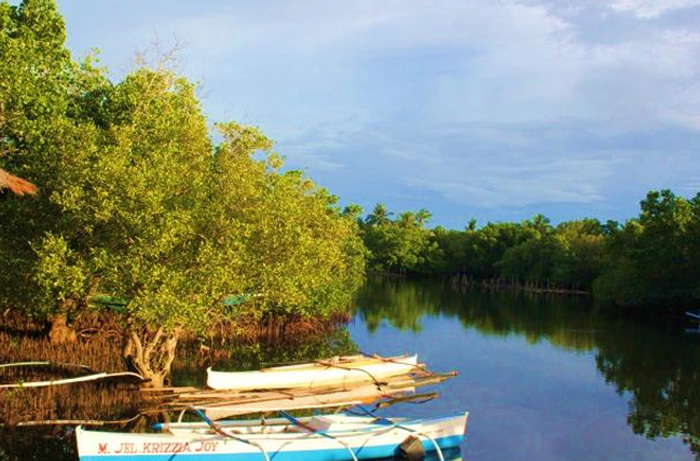 Cruise the river via an outrigger boat and allow them to take you to the most dazzling facet of mangrove forest of Barangay Suba. FISH POND CULTURE – Barangay Suba has two major fish ponds. These ponds are usually equipped with water inlets and outlets that permit independent control of water addition and discharge from the open sea. They usually cultured tilapia, bangus, oysters and among others. FISHPORT & SANCTUARY – A concrete mini port located in Suba’s shoreline which nearly connects the protective area for marine life. An perfect place to view the Poblacion’s long stretch of white sand, mangrove plantation and the nearby islands especially every dawning of the new day. WOODCARVING AND LAPIDA MAKING – Art of shaping statues, ornaments, furniture, and utensils out of wood and cement. Various gouges chisels, drills, and knives then are used for the actual carving. On the other hand, Lapida making in Suba, also plays an important role because it serve as a major maker of Lapida in the locality. In Suba, Mr. Fredo Visaya is populary known for his finest craftsmanship in Wood carving & Lapida Making. STO. ROSARIO FIESTA CELEBRATION – This is celebrated every Oct.6-7. Nightly shows, Grand Discos and Sports fests Cultural Presentations are just few to look forward to. CHRISTMAS BASKETBALL LEAGUE – In their active advocacy to promote sports to their young people, Suba has an annual basketball league held every Christmas vacation Dec. 18-25. CHRISTMAS DAY AND NEW YEARS DAY CELEBRATION – every Dec. 25.